EBL eBooks are now available for members to use. You can download to an eReader, tablet or smart phone; to a computer; or simply read online. What books are included, for example? Over 100 non-fiction titles covering Australian history,cooking, phonics, leadership, marketing and more. 100 fiction titles including Miss Fisher’s Murder Mysteries, The Slap, The Grimstones, Mice, Me and Earl and the Dying Girl and The Mr Badger books (Leigh Hobbs). 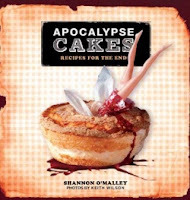 Going by title alone, I think my new favourite book is going to be Apocalyse Cakes : New Recipes for the End, featuring Fallen Angel Food Cake. How do I find EBL? Links and help sheets are currently located on our main eResources page. How do I get into EBL? Once you reach the login page, you will need to enter an active Newcastle Region library card number and your PIN. You can choose from a 1 to 14 day loan period. When loan period expires the book will no longer be on your device or computer. You may download the same book again if you want to. The same book may be downloaded by several borrowers at the same time – no waiting lists. You can find a list of compatible devices, applications and eBook readers here. EBL books can also be downloaded onto the Kindle Fire. For more information see the EBL blog. You will need to download Adobe Digital Editions to your personal computer (this requires you to create an Adobe account). For iOS, Android and Kindle Fire you will also need the Bluefire Reader App (this needs to be registered to the same Adobe account) to download and read eBooks directly. For more information about system requirements visit this link. Once you are in the EBL portal there is a help link – I have found these very useful. If you can’t find the answers you need, please give library staff a call on 4974 5340, or send a query via our ASK a Librarian link. Use these contacts also to suggest eBook titles or subjects for purchase. Hurrah! This is a very exciting development! I think this is excellente! Thanks for dropping by - be sure to let us know the types eBooks you'd like to see.